All the primulas we list do best in neutral or slightly acid soil. They like a partially shaded position and large quantities of organic matter. Barnhaven primroses and polyanthus are bred to be hardy and tolerant of a wide range of conditions, but they are descended from woodlanders and are happiest in humus-rich, well-drained soil which does not dry out. The ideal location for them would be on a slope under deciduous trees, - or in a north-east facing bed. Full sun on frozen foliage, alternating freeze / thaw conditions, waterlogging in winter, or hot dry conditions in summer will all punish the plants. If you get a lot of freezing, a loose covering of leaves or straw will help. Dividing the plants every two or three years helps also, and is a must for the doubles. For best results, feed the plants with a weak solution of high potash or tomato fertiliser every ten days from the time the buds start to form until the first flowers open. A 'thank you' feed when flowering ends is recommended, but don't feed late in the season and don't use a high nitrogen fertiliser. They require the same conditions as the polyanthus and primroses described above, but a little extra kindness will be repaid. Doubles don't have the ability to set seed, but the plant will keep producing blooms in an effort to do so, - sometimes as many as a hundred!! This exhausts the plant and they need to be helped with extra feeding and watering. Picking some of the blooms also helps - they keep well in water. Some organic manure with a higher nitrogen content is welcome, and moisture must be watched during dry periods in the summer. Because no seed is set , old blooms linger on the plant and can cause rot in the crown. Watch out for rot / botrytis and spray if there is any sign of it. Divide the plants every two years to keep them vigorous. Our auriculas are raised to be hardy and to survive without the special cossetting that is sometimes required by show auriculas. They grow well in a normal soil, either in pots or in the ground, but must be very well drained and they appreciate shade at mid-day. Auriculas growing in an old ceramic sink with saxifraga. If your soil is heavy, add some small gravel and a gravel mulch around the plant will help to avoid rot if the winter is wet. It also seems to deter slugs and the dreaded vine weevil. Try to remove dead leaves which fall on your plants. For the best flowers, give a low dose of tomato feed every week as soon as you see new buds, until full flowering. Alpine, border and double auriculas may be grown in the garden, but to safeguard the spectacular beauty of the Show auriculas it is often usual to keep them in pots either in a well ventilated and shaded alpine house, or under some sort of protection outdoors. They don't mind the cold, only excessive wet and the rain on the flowers can wash the farina away. 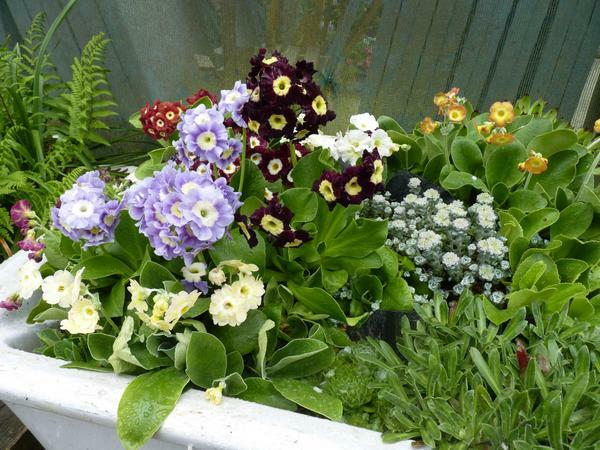 They may be grown easily outside on a north-facing window-ledge or in an auricula theatre. © Colin Humphrey, National Auricula and Primula Society Kent group. Spring - we start to water the plants little by little as the weather begins to warm up, keeping them just moist. As the buds appear we begin to give a small amount of tomato fertiliser, until flowering. Summer - after the flowers have finished we re-pot into fresh compost*. If there are rooted offsets we remove carefully and put into small pots. It’s important not to give your auriculas too large a pot. They do seem to like their roots a bit constrained. We then put the pots into the shade and keep them just moist. Autumn and winter – not a great deal to do apart from keeping them just damp enough to stay alive. All year - Removing dead leaves and stems that come away easily does help to avoid rot. * Compost: each grower has his own recipe but the emphasis has to be on good drainage. We use a mixture of a very open peat based compost, mixed with vermiculite and gravel. Sieboldii are woodlanders also, but cannot tolerate lime. They like dappled shade under deciduous trees, with humus-rich, moist, well-drained soil. They form large root clumps so they need space. Their leaves begin to die down in August, so mark their position. while there may be little evidence of the plant above ground, the root structure is alive and well and working for next year below the surface. A top-dressing of an alkaline -free compost helps. They are also often grown as pot plants in Japan, and grow very well in well-drained compost that shouldn't be allowed to dry out. Simply place them in a shaded place in the garden when they have finished flowering and divide them every couple of years, discarding the centre part of the plant which is usually rotting away. © Anne-Marie Leroy, Photo taken in Japan en 2012. Candelabras are easy to grow but must be maintained in nutritious moist soil throughout the growing season. They are ideal for a bog garden in full sun, - or a damp spot beside a stream. They also do well in groups in acid beds used for rhododendrons or azaleas. They lose their leaves in winter and self- sow profusely. Florindae can grow up to five feet high and the same across in good conditions. They are not really plants for the small garden. They do best in a nutrient -rich bog garden and die down in the winter. They self-sow quite easily and will hybridise with Primula sikkimensis, waltonii and alpicola. The drum-head primula is easy to grow on most garden soils but likes a little moisture and humus. Slugs will eat the centre bud during the winter if they are allowed. It seeds easily but the colours of the offspring are usually duller than good parent colours. After flowering, the leaves become quite large, so make sure to allow enough space to avoid swamping more delicate plants. Divide every couple of years. Easy to grow in standard primula conditions. Plants are short-lived, but a small group will set seed and renew itself. P.allionii are generally grown in an alpine house. A gritty compost is recommended, with a top dressing of limestone chips to keep the neck of the plant from going soggy. Mostly happiest in shallow pans, but don’t overpot. Summer: keep as cool and airy as possible, and water just enough. Autumn : restrict watering and watch for fungal attack. Winter: remove dead and decaying leaves and keep fairly dry. Spring: enjoy, give some gentle feeding and remove dead flowers after flowering. A good time to re-pot. P.marginata are very hardy. With good drainage they grow well in a trough, crevice or rock garden but for their full glory to be appreciated they are often grown in a cold greenhouse where the beautiful farina on their leaves is protected from the rain. Seasonal care as above.